and how the Church conspired to suppress them. The oldest Biblical manuscripts in existence, the Dead Sea Scrolls were found in caves near Jerusalem in 1947, only to be kept a tightly held secret for nearly fifty more years, until the Huntington Library unleashed a storm of controversy in 1991 by releasing copies of the Scrolls. In this gripping investigation authors Baigent and Leigh set out to discover how a small coterie of orthodox biblical scholars gained control over the Scrolls, allowing access to no outsiders and issuing a strict "consensus" interpretation. The authors' questions begin in Israel, then lead them to the corridors of the Vatican and into the offices of the Inquisition. With the help of independent scholars, historical research, and careful analysis of available texts, the authors reveal what was at stake for these orthodox guardians: The Scrolls present startling insights into early Christianity --insights that challenge the Chruch's version of the "facts". 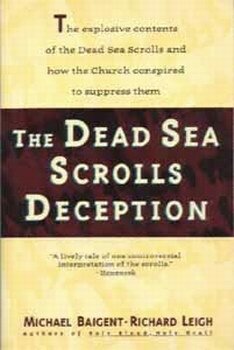 More than just a dramatic expose of the intrigues surrounding these priceless documents, The Dead Sea Scrolls Deception presents nothing less than a new, highly significant perspective on Christiantity. "An engrossing read ... A racy tale of archaeological sins, religious bigotry, academic megalomania, misconduct and possible criminality, along with bizarre political intrigue." "Crystalline, well-documented ... Baigent and Leigh advance startling theories that should change the way we view ancient Judaism and nascent Christianity." "A wonder of savage detail ... The reading of the archaeological, historical and analytic-textual evidence is always ingenious." "Not for the theologically faint of heart." Michael Baigent graduated from Canterbury Un iversity, Christchurch, New Zealand. Richard Leigh followed his degree from Tufts University with postgraduate studies at the University of Chicago and the State University of New York at Stony Brook. Together the authors have also written Holy Blood, Holy Grail; The Messianic Legacy; and The Temple and the Lodge. Both writers live in England.